Oil: Not yesterday’s fuel – just yet? 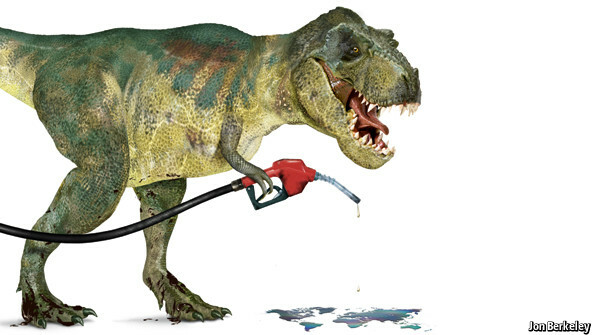 Everybody is talking about the end of the oil age again. The Saudis want to get their economy off oil in a couple of years. And electric vehicles are coming sooner than we or most forecasters previously expected, as we show below. But is the case closed for oil? Probably not. Exactly because of the price uncertainties and postponed investments, there might be a couple of good years left for oil producers at some uncertain point in the future. Expectations have by now run ahead of reality, as they tend to do periodically when people focus on the direction of change but neglect its speed and the feedbacks. ‘Countless times the end of the “Age of Oil” has been forecasted. All of these forecasts were wrong so far. But that does not mean that they will always be wrong in the future as well.’ – we wrote two years ago in our post titled How will the “Age of Oil” end? So where are we now? Things have been changing much faster than we thought previously. We have literally come off the map since 2011, in terms of battery cost reduction (as well as in terms of the price of oil). But note that these two things act in the opposite direction for the switchover to electric cars. Battery cost is still the main impediment for electric cars to replace gasoline and diesel ones. Electric cars are way more efficient and easier, cheaper to manufacture. So far, batteries have been prohibitively costly. But this is changing fast. If the cost of batteries declines further in a similar pace as it has been doing in the past couple of years, a breakthrough may come in the early 20’s. Which means that an EV would be cheaper than a fossil fuel car without any subsidies, in terms of lifetime ownership costs. Above the breakeven lines, electric cars are the cheaper option, below the lines, gasoline-powered cars are the cheaper option. The breakeven lines compare simplified total ownership costs (car price+fuel cost) at 5% real interest rate, and current average retail price conditions, kilometers driven and fuel used. Electric cars are assumed to cost USD 1500 less (apart from the costly batteries) than gasoline cars (an electric engine is cheaper than an internal combustive engine, etc.). Battery cost figures are estimates based on various news sources. Even though German fuel prices are much higher (due to excise taxes), still, the breakeven is closer in the US. This is because people drive more on average in the US, so much so that annual fuel expenditures are in fact similar in Germany and the US. Moreover, the retail price of electricity is also much higher in Germany (due to higher network/distribution fees and renewable subsidies). Net of excise taxes, German breakeven would be even further away. However, for a while electric cars will likely stay subsidized, both directly and both indirectly through lower taxing of the fuel. Ownership costs are an important factor of car choice, but not the only one. Even with fast charging, charging an electric car takes more time than filling up a gasoline car. This is not a problem if one charges at home during the night, but it might be a problem when on the go. Thus infrastructure will also need to grow before electric cars can spread. Here, government involvement is also key. A few years ago barely any consumers could name an electric car – now everyone is talking about Tesla. Hype also brings the changes forward a bit. But just a bit: of course there wouldn’t be such a big hype if costs hadn’t come down. Transportation consumes around 60% of oil globally, and gasoline itself accounts for around 33%. So a revolution in passenger transport (which is the main user of gasoline) could directly hit 1/3 of overall global oil consumption. This is a lot. Oil’s resilience has in fact been due to its primacy in transport. Once that is gone, oil’s role will diminish. Such a revolution of course does not happen overnight as car stocks change only slowly. But there are two things to keep in mind. First, for companies (and company valuations) it is arguably more important what happens at the margin, i.e. where the growth is coming from. Second, other changes might also affect how cars are used, as we argue below. Cheaper electric cars are coming in the context of two other important and mutually reinforcing developments: the development of self-driving cars and the spreading of the sharing economy. The combination of these three may be the new killer app, speeding up changes. Why do we own a car? Most of us would answer it is because of instant availability and costs. Renting a car every morning is burdensome and taxi is expensive. However, if I could always call an Uber in 5 minutes time and conveniently rent a car if I go on a longer trip, I would probably be better off without a car. But getting an Uber is sometimes impossible and renting cars is still probably a hassle. That’s where the technology of self-driving might help. As we wrote earlier, the technology is rapidly evolving. Some analysts say it might come even earlier than electric cars, since here the main obstacles are in IT capabilities and not in chemical engineering. Google and Tesla (as well as many other manufacturers) are collecting an immense amount of data and doing million kilometers of testing. Thus the technology will probably be ready in a couple of years, but of course how regulators and legal systems respond is another matter. So imagine a self-driving, electric car and add a ride sharing application like Uber. Here, you have the killer app. For your morning commute you can request a self-driving one-seater Mini-like car that takes you fast and cheap to your workplace. For your after-work shopping, you can request a compact-car which picks you up at work and drives you to the mall and then home. For your weekend-trip you can request a mini-van and take the whole family out to nature. This service could be cheaper than any taxi company, since you would not have to pay for the driver’s hourly wage. But the biggest cost decrease comes from the achieved higher utilization of cars: the cost of the car is spread out on a lot more journeys; therefore, the cost of using the car becomes the most important cost-element. And using electricity is not just cheaper (way cheaper: see chart below), the engine is more efficient than internal combustion engines, and also more reliable. With sharing, electric cars would already break even. Assumes 4 times as much travel per car. Own calculations. See other notes for the previous chart. This way, the charging infrastructure and battery range will become less of a burden. Self-driving cars can charge themselves at parking lots around the city and there is also a fully charged car which is available to pick you up. We think these technologies reinforce each other. A self-driving electric car can spread faster than a normal electric car. We do not know when and how exactly they will evolve. The first piece has already been placed: Uber is here and rapidly transforming the mobility market. So will oil prices stay low and we will go straight to a post-oil world? Probably not. Call it short-sightedness, boom-bust cycles, reflexivity a la George Soros, geopolitics, but generally the oil market does not move in straight and predictable lines, and this time may be no different. So for one more last time, oil may come after oil. Because of the price drop and increasingly the talk of the end of the oil age, exploration and production investments have dropped sharply. Spot oil prices have recovered somewhat recently, but futures prices much less so. So the market believes in a lower-for-longer scenario. US shale production might come back relatively fast if (or rather when) prices recover, but that is not an unlimited resource. And oil demand still climbs around 1% each year while production from current fields declines 4-5%.And do not underestimate the potential for social upheavals and supply disruptions in oil producing countries struggling with collapsing revenues. Many of these are now in deep economic trouble and leaders may run into political difficulties, too, as they have to tighten previously lavish social spending (think of Venezuela or Brazil). This may also lead to disruptions in oil production. An important question will be how the Saudis manage things – will the House of Saud stay in power or will they lose control? Now the country looks very stable and it has plenty of reserves, but the adjustment to low oil prices have not happened yet. On the other hand, a sudden burst of the credit bubble in China, which is getting more likely the longer it is expanding could give another push down to oil prices, as it did in the SE-Asian/Russian crisis of 1997-9. But then again, that would postpone the switchover to alternative fuels a bit further. Only one thing is certain in oil markets, and that is uncertainty. ← Does the IEA’s new World Energy Outlook miss the global transition?